■Recommended spots in Hiroshima: The riverbed of Otagawa. The best place for barbecues and badminton! ■Motto: Where there’s a will, there’s a way. I was really moved when I went scuba diving in Okinawa and saw the fish in the sea. There wasn’t much visibility underwater because the weather was cloudy that day, so I’d like to try it again in better weather! ■Places I’d like to visit:I’d like to see the Moai statues and the Aurora someday. Visiting all 47 prefectures in Japan is also one of my dreams! 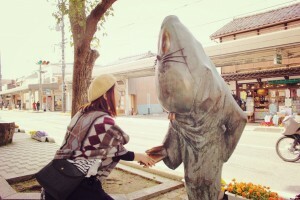 ■Things I like to do in my free time: Discovering new places to enjoy in Hiroshima! ■Final comment:I’m so excited and looking forward to meeting new people at THE EVERGREEN HOSTEL! As one of the staff members, I want visitors to feel at home and welcome at the hostel so that they want to visit us again! My English needs improvement, but I’ll try my best to make your stay in Hiroshima a wonderful experience!